This post by the Pensoft Editorial Team was originally published on the Pensoft blog on 1 Mar 2018 and is reposted here with permission. 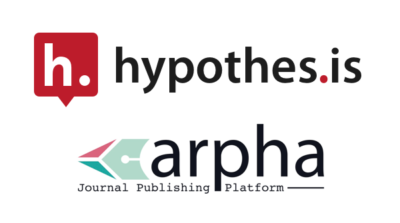 In a new integration, the Pensoft-developed innovative journal publishing platform ARPHA teams up with nonprofit, open-source annotation technology provider Hypothesis to further enable academic discussion and foster collaboration in the spirit of open science practices. This partnership makes Pensoft the second publisher to implement this technology across its whole journal portfolio. Current and future scholarly journals using ARPHA, including Research Ideas and Outcomes (RIO Journal), ZooKeys, One Ecosystem, Journal of Hymenoptera Research and others, will have a new layer added to their content, so that anyone registered with Hypothesis will be able to add public sentence-level annotations within any publication and use it as a starting point for further discussions. All annotations are stored at Hypothesis and listed in the user’s account. Upon opening an article published in any ARPHA journal, website visitors can now spot a dialog-box icon in the top-right of the screen showing the number of submitted annotations, which he/she can reply to at the click of a button. Annotations appear highlighted within the webpage whenever a user is logged into their account on Hypothesis. Alternatively, the user can simply select some text and add a note to share his/her own idea, feedback, opinion or question inspired by the publication. Thus, the content of the research paper becomes alive, while readers could contribute to the study’s discourse. “I am delighted to see ARPHA partnering with Hypothesis not only because this benefits our users and journals, but because it also works for the good of science and academia in general,” comments Pensoft’s and ARPHA’s founder and CEO Prof. Lyubomir Penev. For a better grasp of the Web Annotation Architecture, as seen by the World Wide Web Consortium (W3C), see their interactive infographic. Hypothesis is a US 501(c)3 nonprofit organization dedicated to the development and spread of open, standards-based annotation technologies and practices that enable anyone to annotate anywhere, helping humans reason more effectively together through a shared, collaborative discussion layer over all knowledge. Hypothesis is based in San Francisco, CA with a worldwide team. ARPHA stands for: Authoring, Reviewing, Publishing, Hosting and Archiving, all in one place. ARPHA is the first publishing platform ever to support the full life cycle of a manuscript, from authoring through submission, public peer review, publication and dissemination, within a single online collaborative environment. With ARPHA, journals and publishers enjoy a complete set of services, which enable tailored, technologically advanced publishing solutions. The platform enables a variety of publishing models through a number of options for branding, production and revenue models to choose from. In addition to scholarly journals, the platform also supports open access semantically enhanced books and proceedings collections.